Moroccans perceive their history as officially beginning in 788 when the country’s first independent Muslim dynasty was established under the Idrissids, who ruled through the early 10th century. Although the Idrissid state eventually fragmented and fell to foreign invaders, the descendants of the dynastic founders flourished in the region and today represent one of the four major Chorfa (Sherifian) lineages in Morocco, their prestige due to their descent from The Prophet. The Idrissids established Morocco’s first military forces. They used these forces to establish control over most of what is now northern Morocco and even extended their military power east to the Tlemcen area of Algeria and south to the Western Sahara region. This first Moroccan army comprised mostly Berber tribesmen, and its ranks filled because the country’s inhabitants were loyal to the Idrissids as descendants of the Prophet. The Idrissids were eventually supplanted by two empires founded by indigenous Berber groups in what is now Morocco. These empires were ruled by the Almoravids (1073–1147) and the Almohads (1130–1269). Both ruled large parts of northwest Africa as well as southern Spain, and each was founded and consolidated by powerful military rulers. Both dynasties had a more complex military structure than the Idrissids, consisting of a central army, tribal auxiliaries, and a naval branch. In 1212, a coalition of Spanish kings defeated the Almohads, and the dynasty was replaced by another Moroccan-Berber dynasty, that of the Bani Merin, or Merenids (1215–1420). Originally Berber tribesmen from what is now eastern Morocco, the Merenids developed a military apparatus to fight wars not only in Africa but also in Spain. They emphasized armament, becoming the first dynasty to use gunpowder artillery. Under the Merenids, some basic political and cultural institutions and traits emerged that continue to shape contemporary Moroccan society. The most significant of these is the makhzen, or royal domain. The makhzen, through its autonomous status and its clientage systems throughout the state and society, remains the power base of the Moroccan monarchy. The Saadian dynasty (1509-1659), founded in what is now southern Morocco by Arab Chorfa, established its rule over Morocco and expanded its political and economic control across the Saharan region. The Saadian sultans maintained a formidable military to meet major challenges to the Moroccan state, including that posed by Spain and Portugal, which assailed Morocco by sea and land. Another major military challenge was the Ottoman Empire to the east, which had conquered North Africa from Egypt to Algeria by the mid-16th century. The Saadians checked the Ottoman Empire’s further westward expansion, using a combination of diplomacy and military means. The Saadians also maintained a large fleet, which operated primarily in the Atlantic to protect Moroccan merchant activity. When Spain’s government expelled its remaining Muslim population in the 16th century, many of these Muslims relocated to Morocco and the Atlantic port of Sale (opposite Rabat). Many Muslim refugees joined the “Salee Rovers,” corsairs who operated through the end of the 18th century. The corsairs, as well as the regular Moroccan fleet, were armed with state-of-the-art cannons. Military technology, particularly in artillery, was a hallmark of the Saadians. After 1610, the Saadian dynasty declined and was eventually succeeded by another southern Arab-Chorfa dynasty, that of the Filali, or Alawis, whose rule continues to the present. The Alawi rulers, in order to take power, had to develop and maintain a military capable of conquering and holding the former Saadian territory, fend off rival domestic aspirants to the Moroccan throne, and deal with attempted encroachments by the Ottomans. Through a decades-long series of wars that ended in 1665, the Alawi rulers, using a mainly cavalry force, finally gained control of the Moroccan state from the Atlantic and Mediterranean to the Saharan desert region. The Alawi dynasty is the longest-ruling and most successful dynasty in the country’s history. Despite periods of internal turmoil, foreign wars and invasions, and the French-Spanish protectorate of 1912–1956, the Alawi state has survived challenges to its rule, strengthened the power of the monarchy, and unified and modernized the country. Part of this effort involved modernizing the monarchy while preserving its control of the military and the government and ensuring it had progressive control over the ulama, the group of Islamic clerics responsible for guiding the administration and application of Sunni Islam in Morocco. The king retains the ancient titles of “commander of the faithful” and “commander of the Muslims.” In addition, the monarchy, as a Sherifian institution, is patron of all of Morocco’s Chorfa, a sizeable and influential portion of Morocco’s population. Moroccan military personnel take their oath of office to God, the king, and the Moroccan nation seriously and are reminded of this message throughout their career. Loyalty and valor in combat have been recognized as the key values among soldiers, and as such have been well-documented in pre-protectorate times, the two world wars, and the post-independence period. In situations where loyalty is required from personnel, regardless of other factors, soldiers are recognized for their valor and bravery wherever possible. The FAR also recognizes sacrifices made by soldiers and their families. A prominent example is the treatment that FAR personnel held prisoner by the FP received in the Moroccan press, which also publicized the plight of their families. When the FP began to release the Moroccan soldiers, their return, often after almost 3 decades of imprisonment, was widely publicized in the domestic press, and the FAR itself provided high-profile compensation and recognition. King Hassan II deliberately limited the separate services’ ability to act in concert without his direction and oversight. The military’s inability to act in a joint environment contrasts with that of the United States and most European forces, as well as that of Morocco’s rival, Algeria, where the concept of joint operations is a major facet of the counterinsurgency doctrine. Tactical proficiency is generally limited to performance within the separate military services. Although the FAR recognizes this shortcoming, overcoming this unfamiliarity with joint doctrine and practice remains a significant hurdle for Morocco’s military. The FAR’s ability to work with foreign military forces in peacekeeping missions or with foreign troops on joint exercises, however, frequently depends on the motivation of the units involved as much as any training or collective skills. In general, foreign military commanders and their units find Moroccan counterparts eager and willing to participate in any way they can. The Moroccan public in general has high respect for the FAR and its personnel and the military profession in general. Family members support military personnel, as a service career represents long-term secure employment with a reliable and predictable income. These benefits of a military career have high appeal in a country marked by a general scarcity of well-paying, steady employment, particularly outside urban areas. Garrison towns consider themselves fortunate to have units stationed nearby, as the economy benefits significantly. 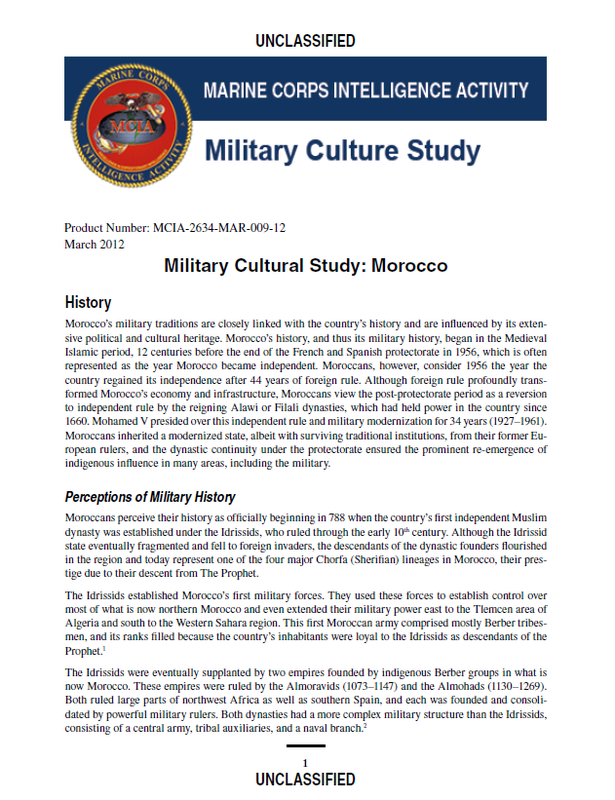 In pre-protectorate times, the Morocco military had few constraints regarding behavior in the field, besides loyalty to the king and obedience to the commands of his officers. The French government implemented standards of conduct, including international laws of war, in its recruitment of Moroccan personnel in the World Wars and in colonial missions. The FAR has upheld these standards since Morocco gained independence. Nevertheless, conduct issues have been reported regarding situations in which military personnel acted with relative impunity. In general, Moroccan forces serving with international peacekeeping missions have worked hard to conform to standards set by the UN and similar organizations. Nevertheless, allegations of sexual improprieties involving FAR personnel and local nationals have arisen during Moroccan forces’ deployment on peacekeeping missions in Cote d’Ivoire and the Democratic Republic of Congo. Such issues have been addressed quickly and definitively by the FAR, however, in coordination with the UN.